Add a touch of elegance to your guests' dining experience with the stylish yet economical Thunder Group CR212BU Purple Melamine Oval Platter 12" x 9". 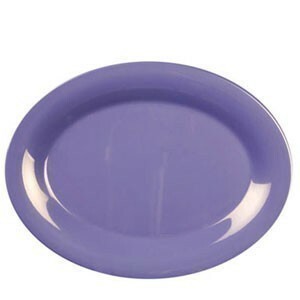 Available in seven different colors, this purple platter is designed to improve the aesthetic appeal of your specialty dishes. Crafted from heavy-duty melamine, this NSF certified piece of serviceware is break resistant, dishwasher safe and designed to withstand a wide range of temperatures.